Sadly, RT does not question the "usual suspects", but merely apes them, in pushing the Anti-Catholic propaganda. Typical deceptive journalism. Further, the anonymous RT writer also states: "other examples of anti-Semitism can be found in his 1920 work The New Jerusalem". This forms a new paragraph and the anonymous writer does not reference the Zionist. We can tell this was a grossly ill-prepared article as even basic facts were got wrong. I am pleased to see G.K. Chesterton's photograph alongside the brave and long-suffering Captain Dreyfus, a man of saintly endurance. My understanding is that Chesterton was never on any official index of anti-Semitic propagandists as far as Jewish research goes. His brother Cecil wrote a number of offensive things about Jewish people, but G.K. condemned Hitler from the start. Read William Shirer's 'The Collapse of the Third Republic' (1969) for a detailed account of the anti-Semitism in France that led to the wrongful conviction of Dreyfus. There have also been a number of recent books on the Dreyfus Affair which show the French military chiefs and politicians of that time in an appalling light. Isaac Bashevis Singer has written brilliantly on the anti-Semitism in Poland, and there are many studies of the pogroms in Russia. Bernard Malamud's imaginary reconstruction of that period, 'The Fixer', explores the psychological roots of Russia's relentless persecution of poor Jews. A great novel. We need only think of the Jewish ghettoes brutally enforced in Catholic Europe as well as Martin Luther's savage incitement to violence against peaceful and law-abiding Jews. Mahler had to convert to Christianity or his music would have had little chance of being received in the Austro-Hungarian Empire. 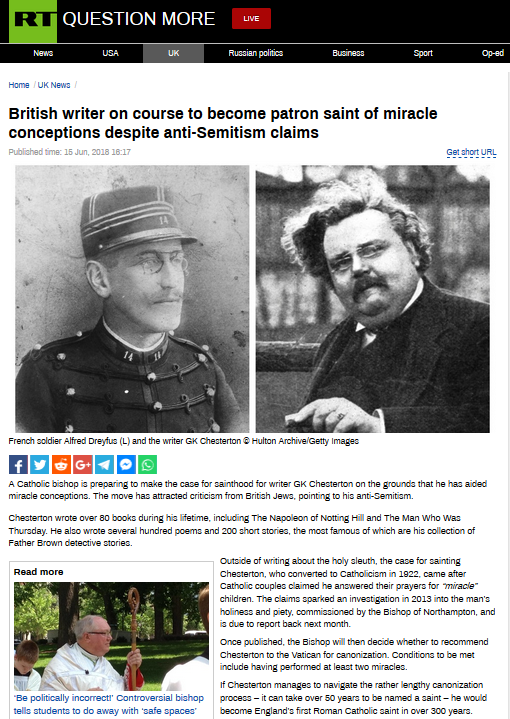 Chesterton never believed the Protocols of Zion or any of its evil fabrications; the French Catholic writer Andre Mauriac along with the Catholic philosopher Maurice Blondel would have nothing to do with the kind of anti-Semitism that allowed the deportation of many thousands of French Jews to Hitler's extermination camps. A book I often return to is Alfred Kazin's classic autobiography 'New York Jew'. I also recommend the recently published 'Anne Frank - the Book, the Life, the Afterlife' by Francine Prose. It is awful to think of Captain Dreyfus being shackled in irons every night on Devil's Island for a crime he did not commit. After his years of torment he showed no bitterness on his return to French soil. I would be very interested to learn more about "anti-semitism in Poland", as I would to learn more about anti-Polonism coming from Jewish leaders and intellectuals. I would recommend to readers "The Jews" by Belloc. Dear Barona, Why do you put inverted commas around my phrase (anti-semitism in Poland) but not around your own term, anti-Polinism? There is no question about Poland's shameful history in its treatment of Jews. Read about the anti-semitism in Romania and you will weep. Read about the Nazi Klaus Barbie in France when French Jews were deported to death camps with the co-operation of French politicians. Read how the Netherlands might have saved its Jewish population and did not. The father of Karol Wojtyla (Pope John Paul II) was said to be unusual in that he displayed no anti-semitism in conversations with his son, unusual in a Polish army officer. Europe was a verminous breeding house of anti-semitism. All over Europe Jewish children had to hide on Good Friday because gangs of Christian children wanted to hurt them since Jews were perceived as 'Christ killers'. Catholic children were only repeating what they had heard in church and on their parents' knees. Wojtyla was given sanctuary in his seminary or he would have been conscripted into hard labour by the German army. He admitted that he and his fellow seminarians and priests were unable to save a single Jew from deportation and certain death at the hands of the Nazis. When Karol Wojtyla became pope, the propaganda machine in Rome went into operation, suggesting that the young Wojtyla had been instrumental in saving Jewish lives. All nonsense. See the book by David Yallop: 'The Power and the Glory - Inside the Dark Heart of John Paul II's Vatican' (2007) which was praised by the Dominican priest and theologian, Father Tom Doyle. There's a terrifying account by Isaac Bashevis Singer of getting shaved by a barber who goes off on a rant about how much he hates Jews. Singer says that if he had spoken one word aloud the barber would have known he was a Jew, probably because Yiddish-speaking Jews spoke Polish with an accent. Singer sat there listening to this torrent of filth and abuse, all the time feeling the cut-throat razor just inches from his throat. Jews were said to murder and eat the body of a Christian baby on Passover. Dostoevsky repeats this evil lie in his novel 'The Brothers Karamazov'. The minds of people were poisoned by these stories which emanated from the very heart of Catholic and Protestant teaching. Adolf Hitler was able to proceed with his programme of Jewish genocide because of this legacy. Hitler used a portrait of Martin Luther on Nazi street posters. My dear John you say that "antisemitism" "emanated from the very heart of Catholic....teaching"? "All over Europe Jewish children had to hide on Good Friday..."; Catholic children "repeating what they heard in church..." What are you saying? Any hatred of a Jew because he is a Jew has never been Catholic teaching. This is precisely the arguments put forward by the enemies of Our Lord and His Church. As to Poland's treatment of Jews, her treatment was most honourable and in point of fact the Jews were invited into Poland by Casimir the Great. Poland has no shameful history regarding her treatment of Jews. After Poland regained her independence following the Great War, Jews had full civil liberties in the Republic. Most of Europe's Jews lived in Poland and knew Poland as the "Paradise of the Jews". If you read Fr. Thaddeus Guz, one of the world's leading experts on Lutheranism; it definitely was not Catholic teaching that led to the Nazi genocide. Sadly, a disproportionate number of Jewish intellectuals prior to the War were communists, and they formed the bulwark of the new totalitarian regime that was imposed on Poland a after 1945. As to all Polish army officers are "antisemites" (expect Woytla's father), this is beyond absurd, but fits perfectly the continual smearing and hatred of Poland because She is Catholic, and Poland is to be wiped off the map. I knew many Polish soldiers from the War and none were "antisemites". In fact, my own grandmother and father risked death to feed Jews during the War. The Singer story seems absurd. How could this man receive a shave without speaking to the barber? Did he use sign language? These unhelpful, apocryphal stories do not solve the historical problems. How would Polish-Jewish relations be helped if a Pole related a story about a Jew who exploited him? The fact is, relationships between peoples is a two way street. Just as Jews should be respected regarding their person and their property, so too Jews must respect the religion, traditions and cultures of the nations they are domicile in. An example of Jewish good will might be the return of the Palestinian refugees and the ceasing of Gaza being a de facto concentration camp. If we are going to discuss atrocities, we need to also discuss not what happened from 1939-1945, but contemporary acts of genocide, which we can actually stop. You will be acquainted with the word Zydokomuna although your readers may not. As you know it is a pejorative term for a Jewish communist or more generally for Jewish Bolshevism. You say that Jewish intellectuals prior to World War II were communists and that they formed the bulwark of the new totalitarian regime imposed on Poland after 1945. I disagree with your analysis; it is simplistic and false. We agree that Poland suffered without end under Nazi Germany and the Soviets. Near where I live there is a Polish club with a plaque honouring the Polish officers who were butchered by the Soviets at Katyn. For many years the Polski community in London campaigned for their own Katyn memorial. When they were finally honoured the memorial was placed in a remote park in south London. The Soviet Union put pressure on the Labour government (under the premiership of James Callaghan) to erase all memory of Katyn. This propaganda term emerged at the time of the Polish-Soviet War of 1919-21 and continued to be used through the interwar period. Yet only a small per cent of Polish Jews voted for the communist party. Most Polish Jews supported the Pilsudski government until his death in 1935. Anti-semitism in Poland began to rise. Secular Jews not attracted by Zionism looked to the Soviet Union as the answer. So did many intellectuals (Jewish and Gentile) in Europe including Britain, as well as the United States. When Moscow annexed eastern Poland (1939-41) they put local Jewish communists in positions of power although these men were later replaced. In the postwar Stalinist regime which bled Poland white, there were a small number of Jews who played a prominent role in the country's administration. Garlinski survived Auschwitz and showed me the digits tatooed on his wrist. We know that Poland's travail pre-dates the barbarism of Hitler and Stalin. Poland was partitioned at the end of the 18th Century between Russia, Prussia and Austria. First confined to the Pale of Settlement, Jews left the shtetls to live in cities, until they formed between a quarter and a half of some urban populations. Street violence and religious intolerance grew. After 1918 when Poland became an independent state there were minority populations pouring in from Ukraine, Belorussia, Lithuania and Germany. This was when the pogroms and discriminating laws against Jews emerged. Polish nationalism made Poland a hostile place for Jews. Isaac Bashevis Singer the son of a Hasidim rabbi, found the climate tense. Very different from the days of King Kazimierz Wielki when Jews were given legal protection and never again had to fear persecution from the Crusaders! Anti-semitism emerged from the heart of Catholicism. Where else did Luther get it from? Or the French-born Jean Calvin who spoke darkly of the 'filthy practices of the Jews'? John Paul, who prayed at the Western Wall in Jerusalem, supported dual-covenant theology (with help from Joseph Ratzinger) and embraced the salvation of the Jews. But it took the church almost two millenia to get there. Sorry John, you are dead wrong, and contradicting yourself in your assessment of the history of Poland and her "shameful history of antisemitism". Poland is over 1000 years old; a few pre-and post war anecdotes does not make Poland any more "antisemitic" (a very disingenuous and confusing term, by the way, as Arabs are semites too), than it makes the Jews "anti-Catholics", for their persecution of Catholics during the Apostolic Age in Palestine and in parts of the Roman Empire. Truth travels a two-way street, and can be bitter to swallow, but it must be, to move ahead with any hope for reconciliation. Just as the Germans owned up to Nazism, so too, Jews should to Marxism/Bolshevism. Just as not all Germans were Nazis, not all Jews were or are Marxists/ communists. However, Marxism is a form of Jewish materialistic messianism, and communism historically was predominantly Jewish. I cannot allow such anti-Polish prejudice on this blog. Further, this a "comment" box, not an "essay" box. Please abide by the rules as a guest in this house. "Unless you believe that I am God, you shall remain in your sin" (Jn, 8:24). Jews, therefore, of our day remain the the descendants of those who once were the Chosen People and heirs of the Covenant. They and all Jews will be objects of a special mercy, because once upon a time they were destined to be the principal bearers of His New Covenant. For the Christian believer, the Jews of contemporary Judaism are in the outer darkness. The fact of revelation lays a series of strict commands on Christians" (God's Chosen People, Vol 1. p 23-24). It might also have been said by Canada's wittiest novelist, Mordecai Richler. We could be here all day discussing (or debunking) the myth (or half-truth) of Judaeo-Communism. In 1999 a fascinating news item appeared in The Independent newspaper by Adam Lebor headlined: 'Poland Blames Jews for the Crimes of Communism'. Read it online. And in 2013 there was a news report headlined 'Putin: Jews Ruined Russia'. Again online. So blaming the Juden continues into the 21st Century! One can imagine Hitler cackling in hell. 'Stalin's Jews' by Sever Plocker. And a much longer text - 'Jewish Identity versus Marxist (or Bundist) Identity' by Faith Alex Perkins. I would also recommend a book of wide and searching depth, 'German Idealism and the Jew' by Michael Mack. AJP Taylor wrote a useful introduction (1967) to The Communist Manifesto for Pelican Books in which he stated that John Strachey was one of the few original Marxist thinkers although Strachey underestimated the resilience of capitalism and its ability to adapt. We are now seeing multinational corporations ready to sue democratic governments using high-powered litigation lawyers. Ah, Progress! In my first comment I ought to have said that Jewish life flourished in medieval Poland, 80 per cent of world Jewry living there under legal protection. These rights were even extended under King Casimir (Kazimierz) all of which made Poland a paradise, unlike Russia with its pogroms described by the great short story writer Isaac Babel. Babel was murdered at the behest of Stalin. If you haven't done so, watch Israeli writer Amos Oz on YouTube. His parents fled central Europe for Israel in the 1930s. I hope you always regard me as a good house guest. The faith of Poland has been a light for all who base their hope on Jesus Christ.